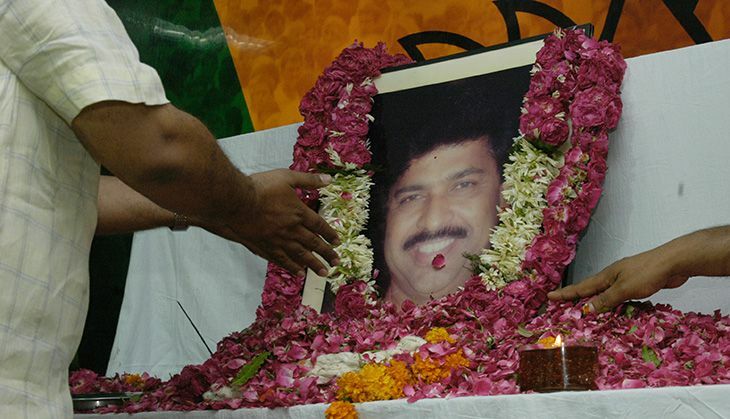 Pramod Vyankatesh Mahajan, a second-generation Bharatiya Janata Party stalwart and a lifelong member of the RSS, was assassinated on 3 May, 2006. Pramod Mahajan was a man of his times, a strategist, a thinker, a natural orator and a clever politician. On the 10th death anniversary of the leader, here is a closer look at the life and times of this political heavyweight. 1. Pramod Mahajan worked very closely associated with the Rashtriya Swayansevak Sangh (RSS) all his life. But he became an active member only after he became the sub-editor of the Marathi newspaper Tarun Bharat, from 1970 and 1971. In 1974, he became a full time prachrak of the RSS. 2. The Lok Sabha elections of 1996 brought the BJP to power and Mahajan was appointed Defence Minister in Vajpayee's 13-day ministry. When the BJP returned to power in 1998, he was appointed the adviser to the Prime Minister. 3. Despite winning only one Lok Sabha election in 1996, Mahajan was considered to be a mass leader, and is often credited for being the only person who was capable of making the BJP and the RSS work together. 4. He was the BJP's master strategist and was the brains behind LK Advani's historic Rath yatra from Somnath to Ayodhya. He was also in-charge of Murali Manohar Joshi's Ekata yatra across the length of the country. 5. In May 2015, the BJP-led Maharashtra government announced the 'Late Pramod Mahajan Skill Development Skill,' in order to evaluate existing and new schemes of skill development. 6. "Even if Pramod had not been in the BJP, he would have been an inspiration to the youth all over the country," Atal Bihari Vajpayee had once said.